If you’ve ever visited London’s Chinatown, then you’ll understand the difficulty of choosing which of the many restaurants to eat at. The main street, Garrard Street, is packed with Chinese restaurants, dim sum parlours, bakeries, supermarkets and street vendors, and I can never seem to remember which ones I’ve been to and which ones I haven’t. I think it’s more fair to say that Opium is a cut above the rest of Chinatown’s eateries. And since I visited there for the first time over a year ago, I haven’t had eyes for any other restaurant or bar on Gerrrard Street. Well hidden behind a jade door and a considerably sized bouncer, Opium is what I believe to be Gerrard Street’s best, most unique dim sum parlour and cocktail bar. Opium opened in 2012. 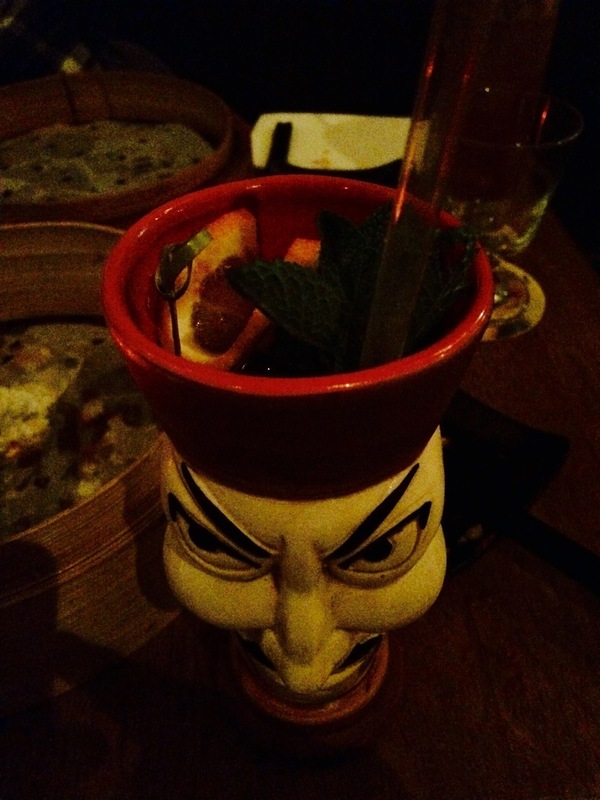 And is a multi-floored 1970’s-style Asian wonderland for those with a passion for original cocktails and Chinese cuisine. The restaurant is split into three main rooms, each with a different feel, The Apothecary Bar – which serves cocktails in Chinese medicine bottles, the Bartender’s Table -situated in ‘The Academy’ where you can watch with wonder as the bar staff work their magic and the arm the tricks of the trade, and The Tea Parlour – which celebrates Chinese tea and dim sum culture. It’s difficult to say what the main event is at Opium, whether you’re there to just drink or just eat, both the dim sum and the cocktail on offer make Opium worth a special visit. The dim sum menu has all the usual suspects; char siu bau (barbecue pork buns), king prawn dumplings, spicy duck dumplings and others all ranging from £7-11 a basket. Alternatively you could opt for a seafood, meat or vegetable dim sum platter (£20, £16, £15, respectively). These contain a range of 10 dumplings, and I highly recommend the vegetable one, the mushroom and truffle dumplings are to die for! Cocktails start from £11, and the theatrical menu quite obviously takes inspiration from taditional Chinese flavours and customs, with a lychee martini (gin, fresh lychee, absinthe), and the opium #6 cup (tequila, cactus, pimento, ginger and oolong tea) taking centre stage. But, if you don’t want to brave the weird and wonderful, classic cocktails and more traditional Chinese teas are also available. Opium is open from 5pm until the early hours of the morning most days, and it’s definitely worth booking in advance, although if you turn up on the day you may be able to persuade the large bouncer downstairs to squeeze you in. When booking Opium, be aware that each area of the restaurant has a very different vibe. And be prepared to take a track up some very narrow stairs! If you’re looking for arm chairs and coffee tables, then the Tea Parlour on the top floor is for you, if you want a more rant aura than feel, then you’re probably better off on the first floor. It’s also a great place to look for special deals and masterclasses during London Cocktail Week.